We offer various ship from our official support network available for sale and purchese. We provide complete solution for sale and purchase of ship, clearing the letigations, preparing proper documentation and making timely delivery to the customer. For all your sale and purchase of ships, do contact us. Embarcación de venta y compra de buque para desguace de desguace en chatarra. Tugboats available in India for all type ship towing job works. We are in poistion to provide tug boats of various capacity for towing manned and un-manned ships / vessels. The ocean-going tugs provided by us are capable of accomplishing challenging towing projects anywhere in world. We provide tugs for harbor projects as well as long distance tows in open sea. Tugs available for assisting floating cranes, ship to ship job works, towing flat top barges etc. The tugboats available are best to meet all our customer needs. Tugs are capable of operating in shallow water as well in the deep sea. Available tugboats from 20 bollard pull to 80 bollard pull. With our base location at Mumbai (formerly Bombay) INDIA, we provide tugboats for all emergency tows, like engine failure, etc, round the clock. Our regular performing and active team responds to all emergency calls for the requirement of any marine support and towing services. We support emergency services for rescue, pollution control, preservation of environment and property along with providing all technical support. We have a professional committed team to carry our all emergency and regular tow services. We are located and operative from west coast of India and provide towing services for barges, ships, boats etc from India to Middle East (Gulf) countries. Specialty in handling dredgers, pontoon barges, cargo barge, accommodation barge, wooden boats, small vessel and other floating crafts. We also provide tugboats with accommodation for crew during long voyage towing works. 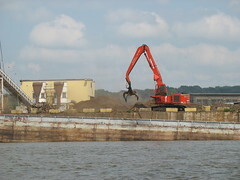 We undertake job works for towing all types’ ships and barges. Other than deep sea going tugboats we also provide shore assistance tugs for round the clock for timely response. With the help of our skilled professionals, staff and onboard crew we are capable of handling any type towing works at any time. d) Salvage Support at domestic and international waters by providing accommodation barges, cargo barges, flat top barges and tug boats. e) Support for Oil Platforms by towing rigs and re-positioning all types and sizes. Contact us with complete details for requirement of tugboats and barges. Tugboats available for towing works like STS operations, ocean going and in harbor operations. 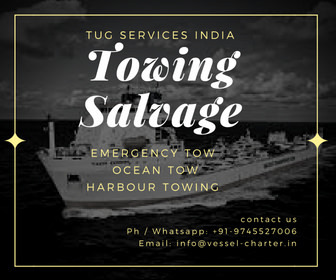 We are service providers, based at west coast India and provide complete solutions for all your towing works with in Indian Waters, neighboring country water limits and from Indian Waters to worldwide destinations. All Tug Boats are well maintained and possess valid documentation and permissions for towing and sailing with in coastal waters and open sea. We provide tug boats of IV class as well as IRS class and are Indian Flag, on single tow works, monthly time charter and long term contracts. Tugs available from 18 Bollard Pull to 50 Bollard Pull and the tugs available are below age of 25 years and are well maintained. The experience crew of tugs handles towing works skillfully to meet charterer’s requirements. 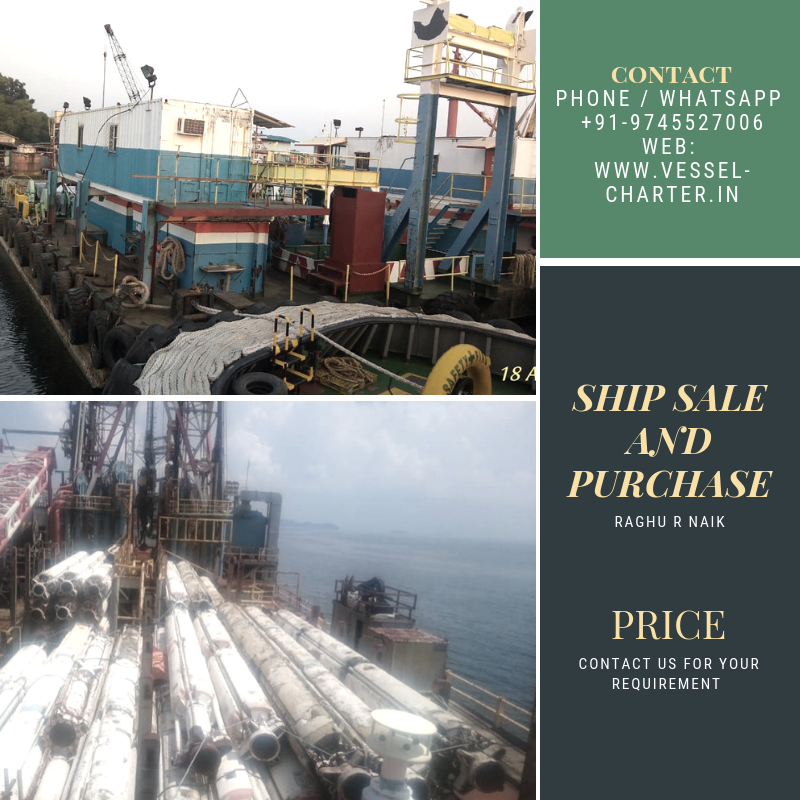 Chartering tugs for single towing job (one port to another) for transporting dead vessel for dismantling, unmanned barges, repair pontoons, dredgers etc are available in short notice. 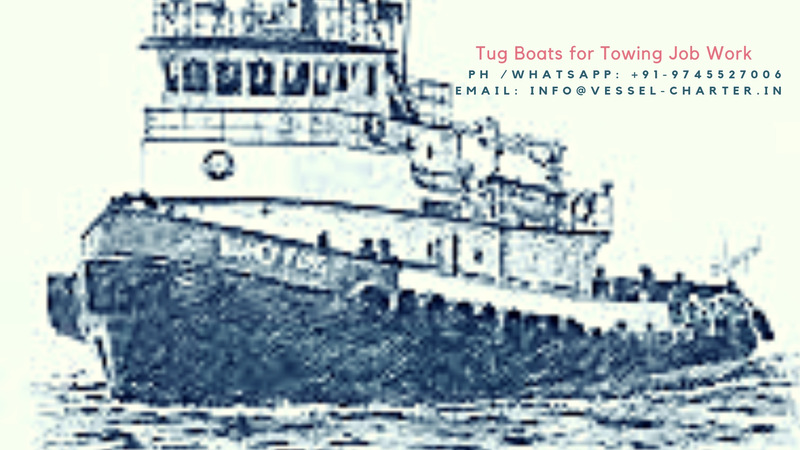 Tugs boats for in harbor operation on call out basis are also available on demand along with monthly charter of harbor tugs. The tugs with their qualified and skilled crew are capable of assisting ships in berthing and de –berthing, narrow channel pull and push, etc. Tug boats for pilotage services, maintenance of navigation aids and buoy markings, fire fighting, etc are available on long term and short time charter. Towing services for long distance from Indian Waters to any safe International ports are also provided. The single voyage towage can be chartered on lump sum basis or per day charter hire rates also. A further service also includes availability of multi utility tug boats for standby and salvage operations. Interested charters get in touch with us on provided contact details with complete details of their requirement of tugboats. The details should include the dimensions and particulars of the towing vessel, scope of work, period of contract and the date of requirement. Mobilization and demobilization charges can be worked out once the work order is confirmed. For all your quarries like particular of available tugs, bollard pull, capacity etc, do call us or write to us any time. Tugboat / PSV / AHT Available for short and long terms charter. Towing works are always in demand for mobilizing / salvaging ship met with engine failure or any other technical problem. Also towing work is required for transporting unmanned craft, pontoons, barges etc. We undertake complete work of providing you with required tugboats for completing your towing operations on time. Vessel are required with extra equipments which supports the supply to offshore platforms and plays a vital role in connecting the offshore platform with mainland. Whether transporting crew / offices, fire fighting and standby vessel or carrying water and mud samples, Platform Supply Vessel (PSV)performs excellent role in meeting all these demands. Our chartering services come with solutions to all your requirement of PSV for short or long terms charters. Tug Boats for towing ships, barges, dredgers, pontoons etc are available on time charter. Ocean going tug boats of 30 bollards pull and above are capable of towing large ships which requires assistance for maneuvering at deep seas. These tugboats are built for the purpose of performing all commercial activities mainly assisting ships at open sea / ocean. Our services are available round the clock for providing tugboats for such job works. The towing of ships, berthing and un-berthing of ships , assisting ships at channels or straits in safe and efficient manner is our specialty. The tugs are made available directly from their owners to the required clients by our company. All required infrastructure to render such services are available with us to serve the clients with most appropriate manner. All tug boats provided by us are capable of pulling / towing of any capacity and at any location. Visit below clip for pictures of Harbor Tugboat available on time charter.